When we think of communicating with consumers through digital devices we know that mobile devices have become far more important in recent years with many businesses seeing more than 50% of consumers website sessions on mobile devices. This growth has led to the 'mobile-first' philosophy, yet we should remember that consumer usage is more complex than this. Many consumers and households are multi-platform, using a combination of smartphone, desktop and tablet devices. 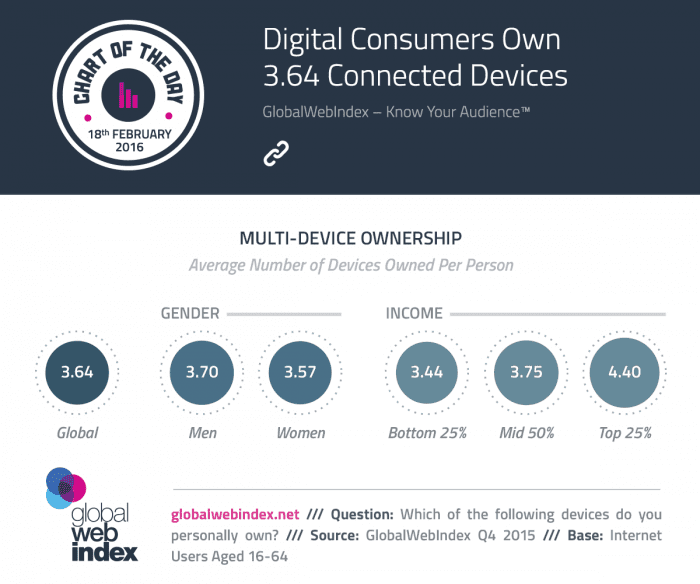 This ownership is shown by this 2016 data which shows and average of nearly 4 devices per person. So typically that will be desktop, phone, tablet plus other devices such as connected TVs or consoles. Another survey by Pew Internet showed that 36% of Americans own a desktop, tablet and smartphone. So a clear implication of the research is that marketing techniques should fit with multiscreening behaviour and this also includes non-connected screens like non-connected TVs. How to use the DRIP model? What are the essential parts of a campaign plan template? The purpose of a marketing campaign plan is to identify relevant, integrated, marketing activities and channels to reach campaign objectives as well as influence customers. An effective campaign plan has …..
How do you go viral without social media? Lost was created by Jeffrey Lieber, J.J. Abrams and Damon Lindelof, was produced by Bad Robot Productions, and was filmed almost entirely on location in Hawaii. The show was produced by ABC ….. Sales teams need tools, resources, and knowledge if they are to perform well – and that’s what sales enablement is, in effect How do you create a sales strategy that works? How do you build a sales team that closes …..